Graduates at the Strathmore Institute graduation ceremony where over 300 certificates and diplomas were awarded. The Strathmore Institute held its first graduation ceremony for Professional and Diploma courses on Wednesday, November 28, 2018. 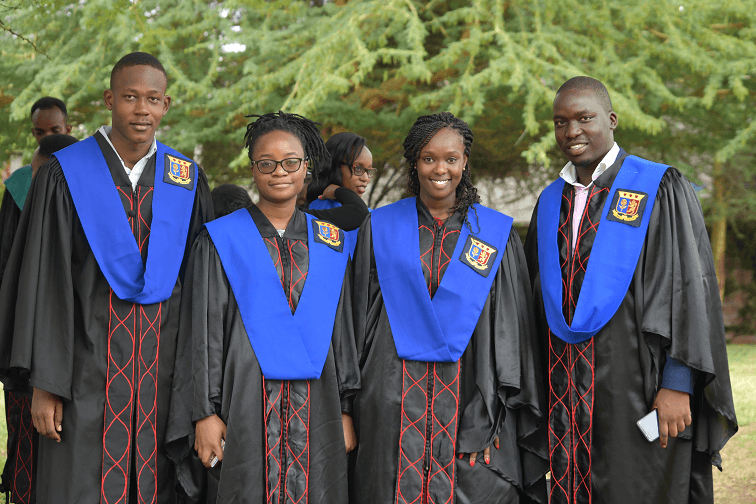 Happy moments and cheerful faces were witnessed among the 314 graduates and their families who represented several countries: Kenya, DRC, Burundi, Denmark, Tanzania, Rwanda, China, Sudan, Nigeria, and Uganda. The SI Principal, Mr. Patrick Kibui, stated that the institute conferred certificates and diplomas to 90 Certified Public Accountants (CPA), 43 Association of Chartered Certified Accountants (ACCA), 103 Diploma of Business and Information Technology (DBIT), one Diploma in Leadership and Management (DLM)and 77 Diploma in Business Management (DBM) graduands in recognition of the outstanding performance in their respective courses. He congratulated the students and encouraged them to give their contribution, however small, to the world. The academic excellence award ACCA was given to Xiao Qin Wu who attained position one, ACCA Affiliate in Kenya & 108th in the world while Antoneatte Njeri Karebe won the best CPA lady graduate award in Kenya, and first position in section 5 & 6 in Kenya in the November, 2017 KASNEB examinations. Mohammad Abdulkarim Abdallah and Stacey Jebet Sang were the overall best in DBIT and DBM respectively. This article was written by Jack Kisutsa.